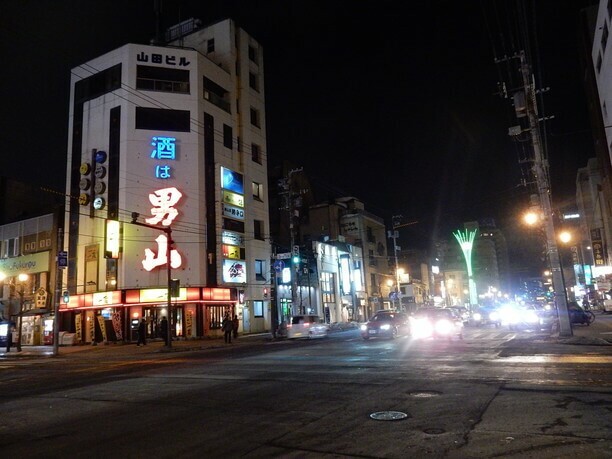 Asahikawa ‘s number 1 entertainment district known as Sanroku-gai spreads out around 3 – Jo street 6 – chome. There are more than 1,000 restaurants and drinking outlets in this area. When the sun goes down, the neon shines brightly and it has a gorgeous atmosphere. Experience the benefits of this area located in the center of Hokkaido. It is characterized by fresh, good quality mountain seafood and plenty of places to get a drink. 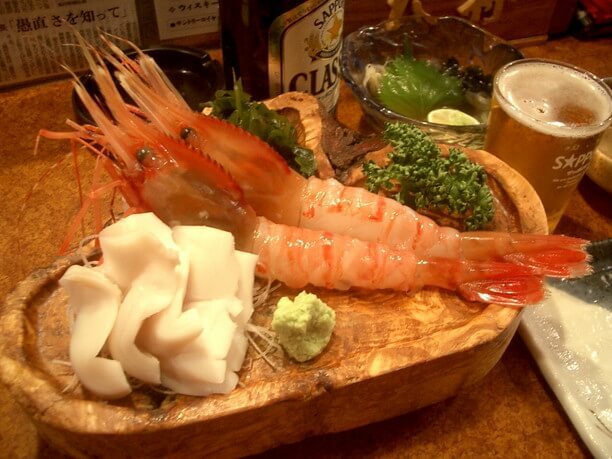 You can enjoy seafood dishes from the Sea of Japan, the Sea of Okhotsk, and the Pacific Ocean. 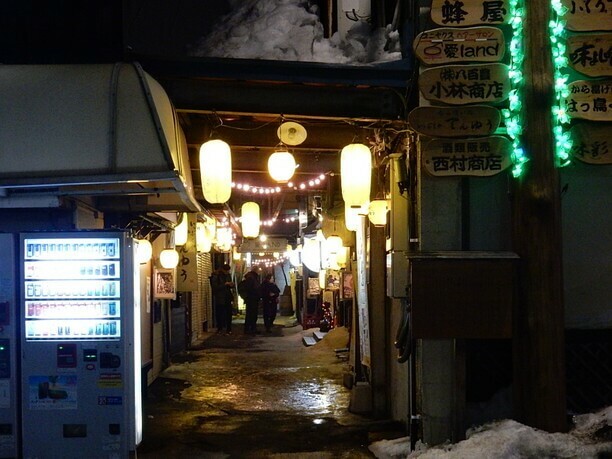 There are many small paths where eateries are built, and drinking walks at night that take you through this fun area. It is an exciting adult time oasis in the center of the city. Enjoy plenty of seafood and drinks! 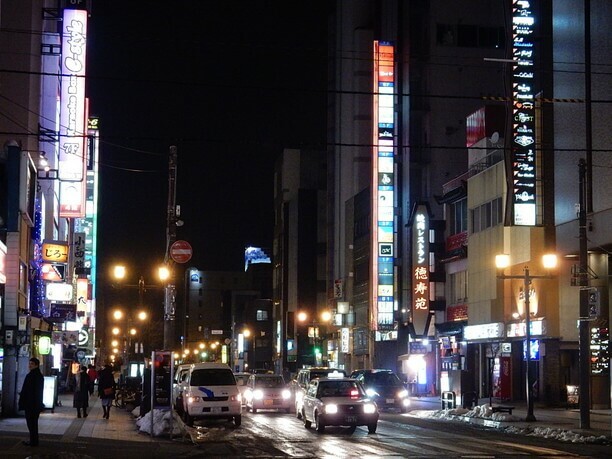 Sanroku-gai is Asahikawa’s largest entertainment district. It is said to be the largest in Northeast. 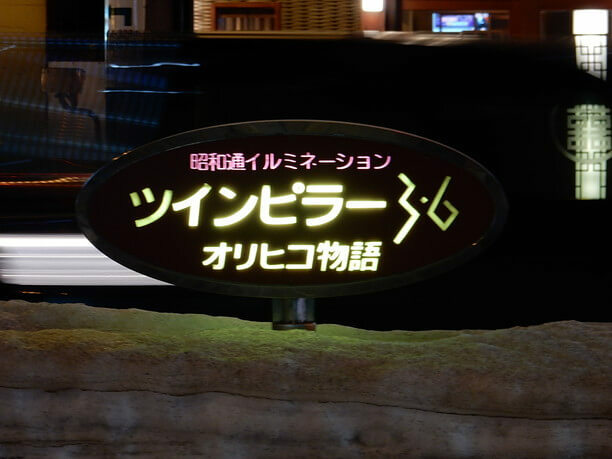 It’s eating and drinking establishments are spread out around the “3 Jo street 6 th chome intersection” where the main neon sign is a landmark. Asahikawa is a key point of transportation in the middle of Hokkaido. As a result, delicious food and drink can be found here that were gathered from all over Hokkaido. Most noteworthy are the freshness and quality of the marine products! You will find seafood delivered from the Sea of Japan, the Sea of Okhotsk, and the Pacific Ocean. seems inland. It can all be enjoyed with plenty of local drinks. 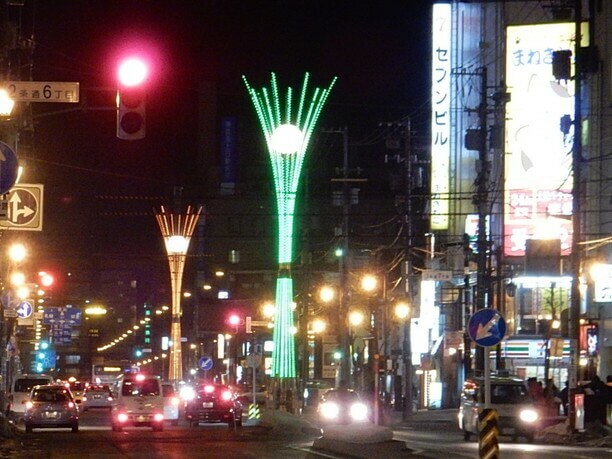 The twin pillars standing side by side in Showa Dori is the symbol of this area where the phrase “a place where people meet” was put in lights. When the sun goes down, the sign shines in orange and green, and together with the rest of the neon in the area, the atmosphere of the street is gorgeous. From old-fashioned to recently designed shops, you will find something to suit your mood! There are more than 1,000 food and drink establishments in this area. There are a variety shops, ranging from taverns to specialized culinary restaurants. It has thrived since the war when it was developed as a drinking street for military purveyors, and there are a few old-fashioned stores that still remain. 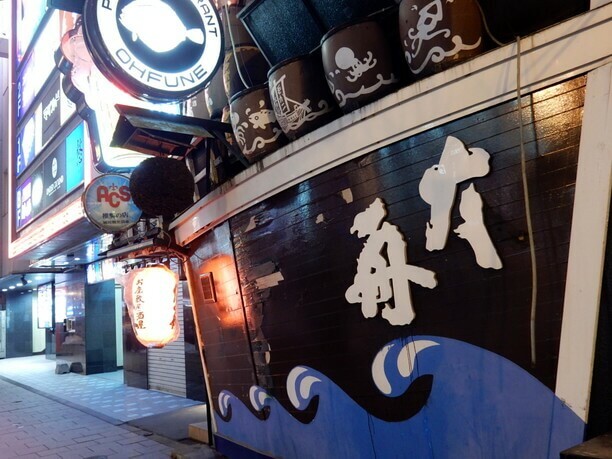 A popular spot is “Ozashiki Izakaya Ohbune”, founded in 1969. The outer wall is in the shape of a ship and makes for an impressive view inside and out. Their specialty is splendid seafood. 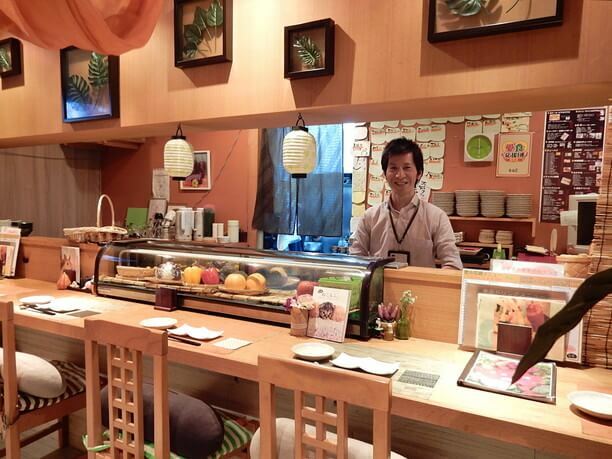 They feature fresh seafood delivered directly from all over Hokkaido. Hakkaku is one of the favorites that they serve. It is typically more than 1 foot in length. 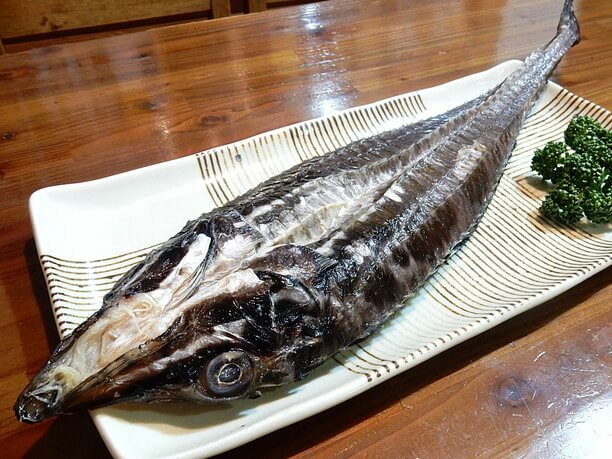 The fish (shown in the photo) is peculiar to the north of the ocean and is typically served as sashimi with green onions and miso. (Lower photo). Also very popular is their fresh shrimp (1 for 680 yen) and elastic octopus head (680 yen). 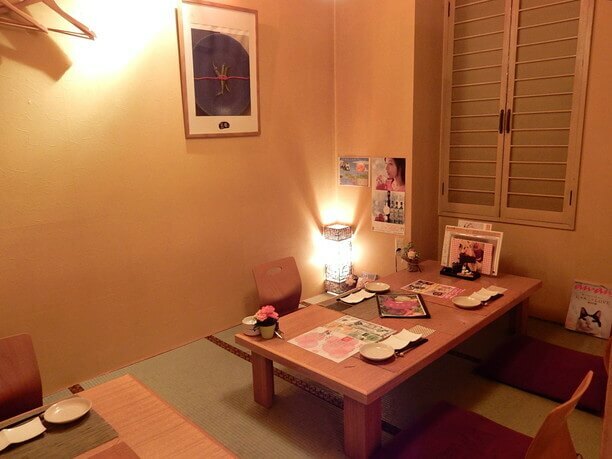 Also popular are the regional dishes such as hizu (780 yen). It is made from the cartilage of salmon nose. Enjoy healthy cuisine in a relaxing space! For those who care about beauty and health, I recommend visiting ‘Touan. It has a rich menu with plenty of vegetables, and is a well-known local tavern. One of their specialties is the Bagna cauda (780 yen). 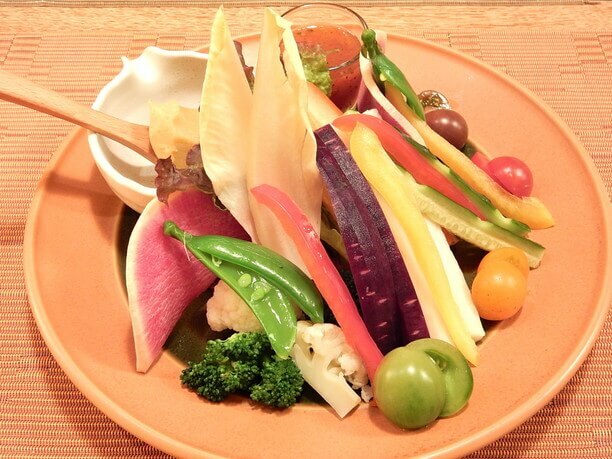 It is 7 to 8 kinds of vegetables that you eat with homemade miso dip or special tomato sauce. The rich flavor of vegetables will spread throughout your mouth. There are plenty of local vegetables on the menu as well! Like the rich vegetable Asahikawa Soy Sauce Yakisoba (750 yen). 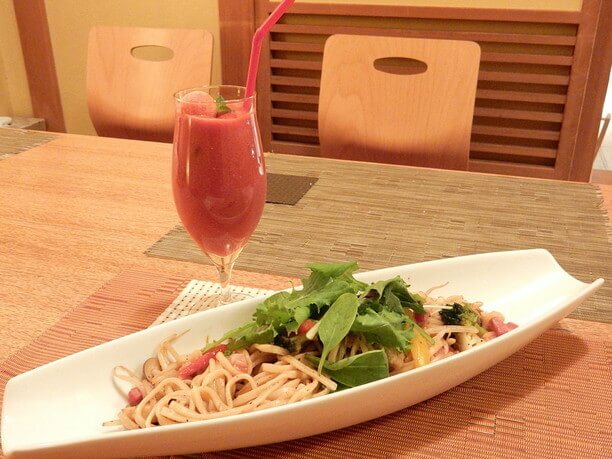 It is fried noodles topped with raw vegetables. There are also many types of cocktails using fresh fruits and vegetables (raw tomato straight 500 yen). It has a snug, hideout atmosphere with fine customer service and a pleasing selection of souvenirs. One of the pleasures of the entertainment district, is its liquor ladder, where you can go from one tavern to the next having a drink at every location. 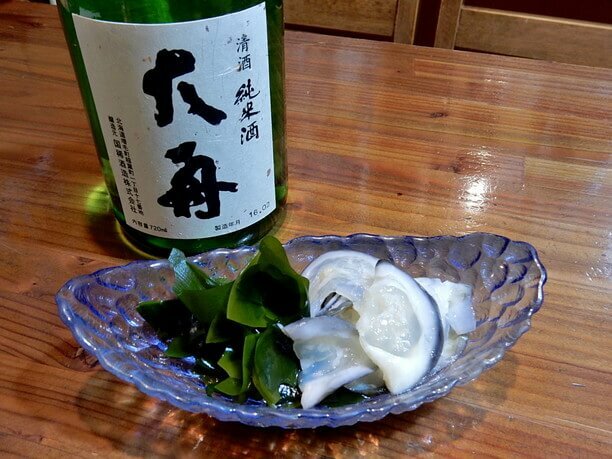 Sanroku-gai is characterized by a number of drinking streets that you can visit. 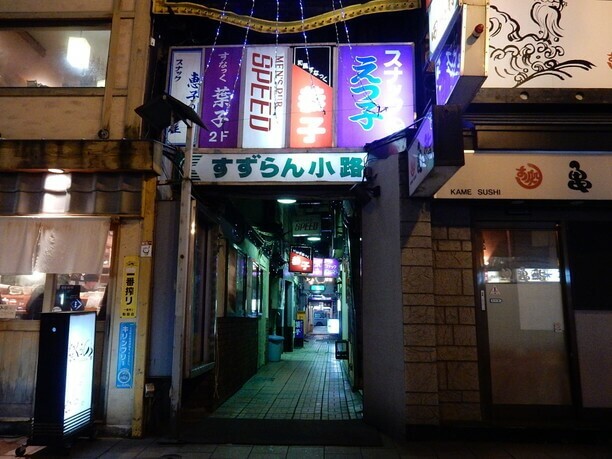 Among them is the high profile “Sazuran Alley.” Here there are more than 10 drinking shops lit up by neon on a covered alley facing 3 -jo street and 6 – chome. Also popular is “Bali street” which has a real exotic feel! And there is “5 · 7 path alley furarito and so on, it is countless. 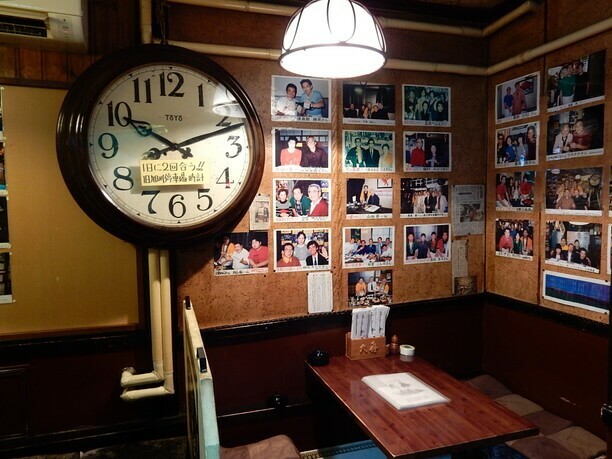 If you like an unusual place, be sure to visit Miyakomichi. Area. 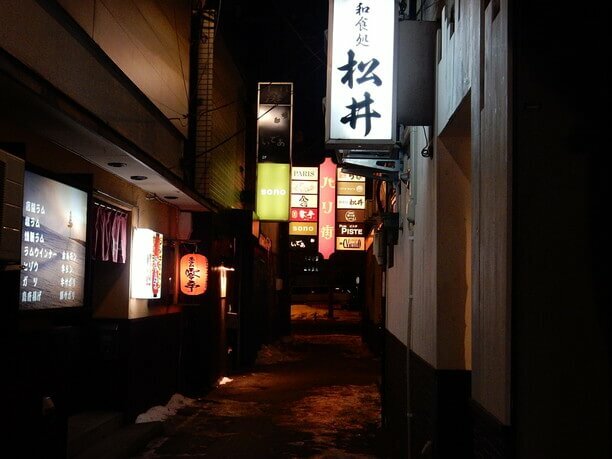 This street is full of interesting places like, the grilled meat restaurant “Baba hormone” which is the representative of local restaurants, and there are plenty of other shops that are filled with atmosphere. 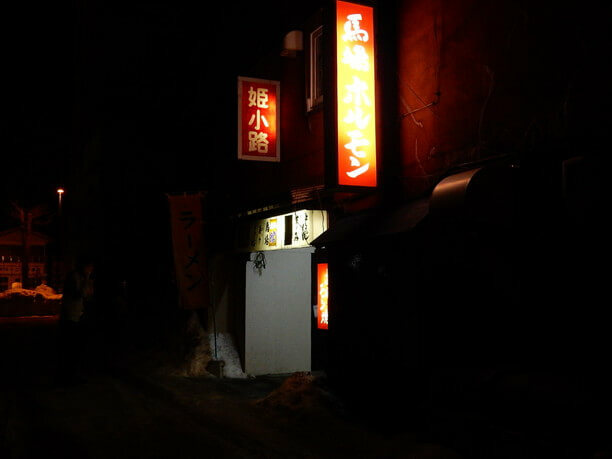 You can enjoy walking down the street like a treasure hunt, even if it is dark, you are safe as a guest of Asahikawa. The biggest event on the street are its annual festivals! This area is the most popular during the “Sanroku Festival,” which is held in summer. 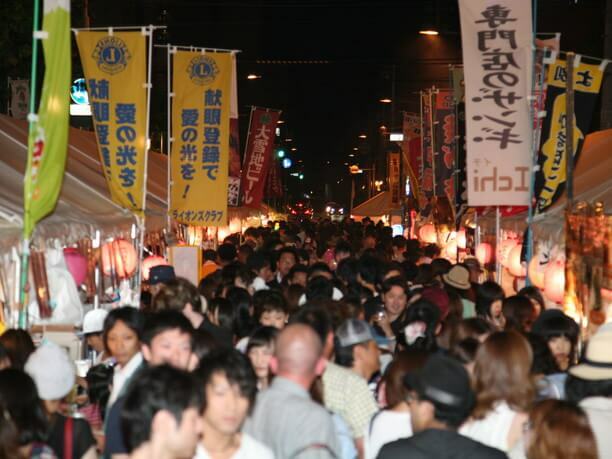 For 3 days of the weekend in early August, 3.jo street 5 and 6 – chome is opened as pedestrian heaven. Fireworks festival and stage shows, etc. are carried out and it is vibrant. 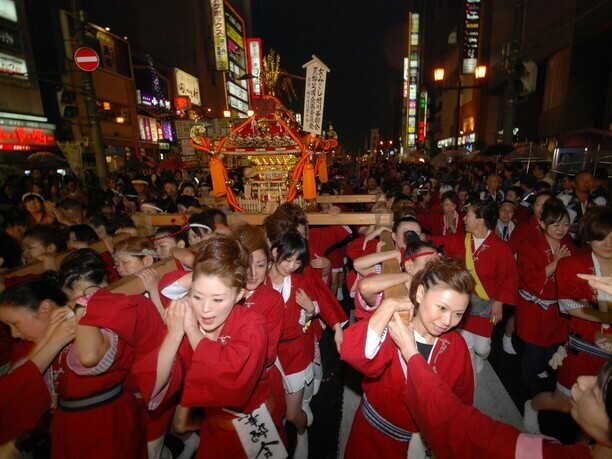 The female Mikoshi Hanayo-kai is the climax of the festival. This is the first Japanese shrine to be carried only by women. The powerful and ornate appearance makes the audience feel excited! There is also the Asahikawa Ramen Festival where you can eat ramen noodles. They have about 70 shopping stalls line up, for 3 days to let you enjoy gourmet unique to Hokkaido. People look forward to this festival, where locals as well as tourists gather! Sanroku-gai combines oldness and newness, glamor and old fashioned comfort. It expresses various aspects of the town, so you can enjoy it anyway you like. It is known as a "safe drinking street." A place that you can go with little worry of possible troubles. It is a place where even girls can visit with confidence. 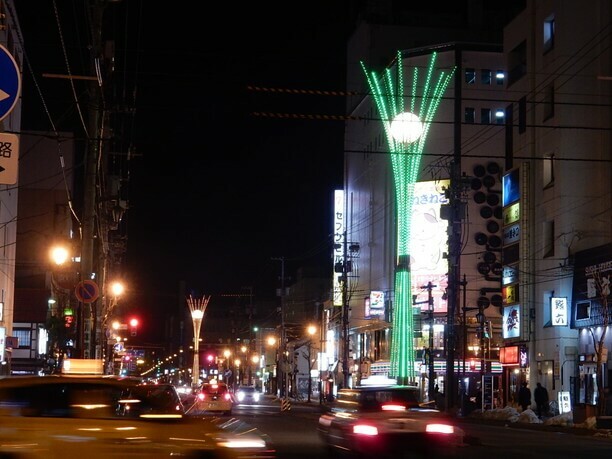 Asahikawa is also called a city of cocktails. There are many conscientious cocktail bars located here. Not many stores are open during the day, but you may enjoy sightseeing throughout the area in the day anyway! There are many bars and shops to visit in this area. To help you get around there are maps of the city in hotels and tourist information offices. Please pick up a map and take a stroll around the city at night.